Hi everyone! 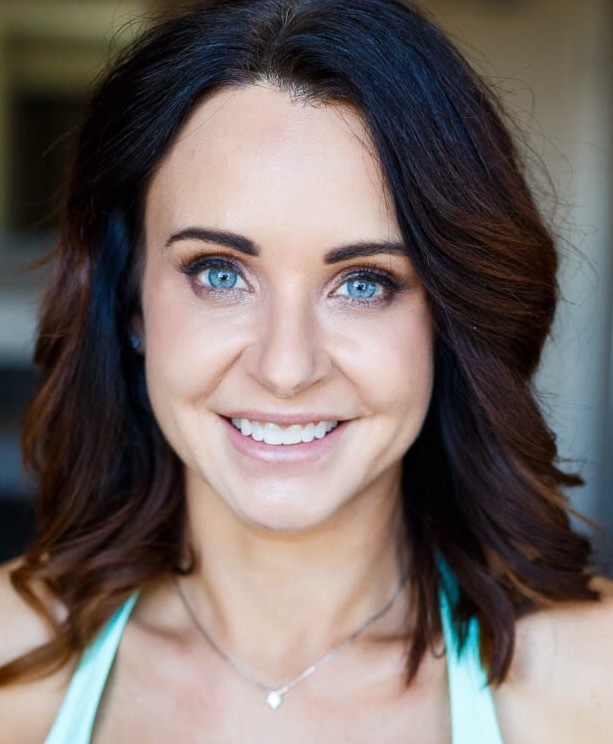 My name is Keri and I have been doing skin care in Kansas City, with Dr. Chhatre for 16 years. I love what I do and am truly passionate about helping everyone I meet with achieve the skin they've always dreamed of. As an esthetician, I am constantly told how beautiful and perfect my skin is, truth is I've always been great at covering my imperfections. We're our own worst critics, right? So I always have a rebuttle and have always had things that I view as imperfect and see many areas that I can improve my skin. I do all of my home care everyday, I wear my Skin Ceuticals Vitamin C and SPF everyday, I use a Clarisonic, I sometimes incorporate a Retinol and I NEVER go to sleep without washing my face. As an adult I have struggled with acne. This can be extremely frusturating, especially as a skin care professional. I know all the ways to treat acne, and my skin just doesn't always respond and I end up with red scarring. I also have A LOT of sundamage. I have been aggressively treating my skin for 16 years with many different clinical treatments and products that we offer at our Kansas City MedSpa, and I haven't let my face see the sun in 16+ years. The thing with sundamage is so much of it is created before we even turn 20. As kids we don't protect our skin, we don't care or think about what our skin will look like as adults. With my heritage, I am predisposed to pigment, I am fair and freckle easily. My sundamage is so much better than it used to be, and I cringe thinking of what it could look like if I hadn't done all that I have, but I still want to see more improvement. I want that flawless beautiful skin, just like everyone else, not too much to ask, right? What if I told you that I have achieved that and you can too? This is where I introduce Halo. This amazing, innovative, one of a kind technology is changing skin care before our eyes. This is the very first Hybrid Laser that incorporates dual wavelengths simultaneously to target almost all skin conditions. It is seriously a game changer. Almost 3 years ago I was lucky enough to have my first Halo laser treatment. I had no clue what to expect, but I've always been up for trying anything that may help me get closer to the skin I've been working so hard for so long to achieve. The procedure was comfortable, the recovery was a breeze and the results were amazing! I've always hoped that this would be something that we would be able to offer, and I'm so happy to say that this amazing laser is now an offered treatment at our MedSpa. We offer many amazing skin treatments at our Kansas City area MedSpa. Forever Young BBL, Laser Peels, ProFractional laser, Chemical Peels, Microneedling, Microderambrasions, etc.. BUT- adding Halo to our menu changes everything. There are some treatments that it may replace for some people, but it can be a great compliment to other treatments. 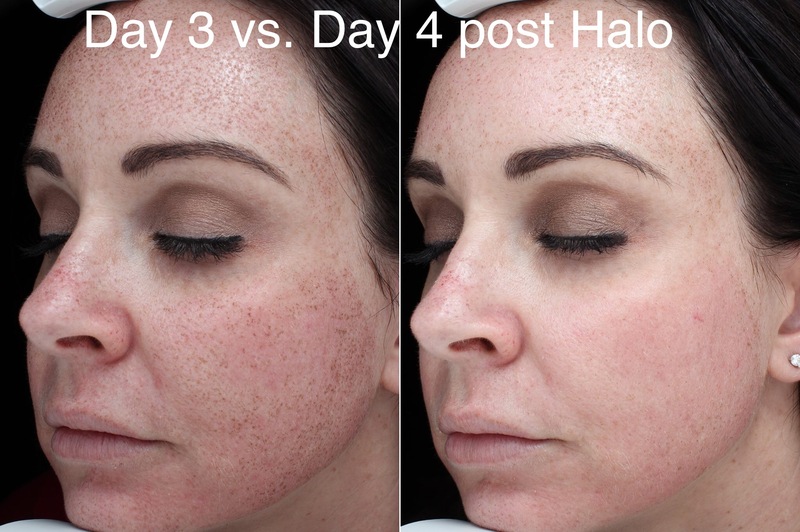 Partnering Halo with BBL and maintaining it with Nano peels, Chemical Peels, Microneedling and microdermabrasions will help everyone achieve the skin they've always dreamed of. Halo by Scition is good for almost everyone! We can treat fine lines, wrinkles, skin tone, texture, scarring, pore size, sundamage, redness and laxity- with one laser in just a few easy, low pain and minimal down time treatments. I was lucky eno ugh to have a Halo treatment recently at a training that Heather and I attended, and 6 weeks later, Kansas City Licensed Esthetician, Heather Mock gave me another treatment. I documented this treatment daily with photos to be able to give a first hand experience and an idea of what expect. Prior to the laser a strong topical anesthetic is applied to the face for an hour. I cannot express how well this product works- I was so numb!! My full Halo treatment was recorded live on facebook and is on our facebook page for anyone to see. I was completely comfortable during the entire laser, which only takes abou t 25 minutes. Following the treatment my face felt hot- really hot. The intense heat was gone in about 30 minutes and went on with my day with no problems. I worked on clients the entire afternoon and was completely comfortable. 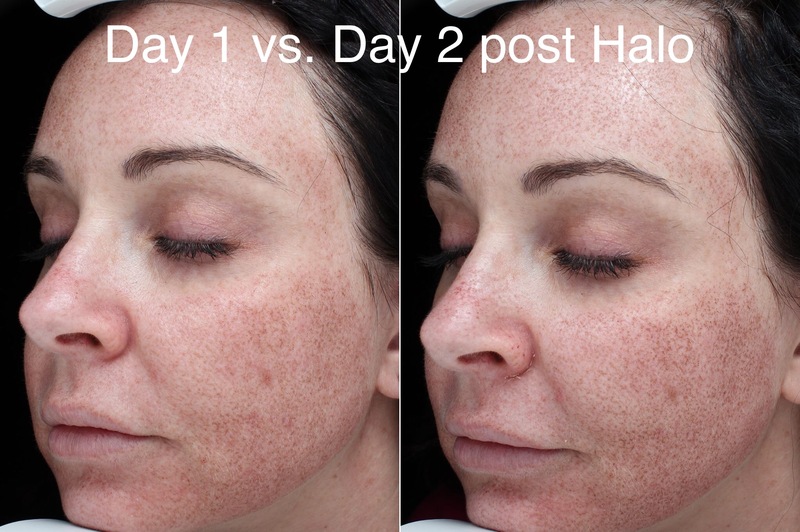 With this laser being ablative(removes top layers of skin) and non ablative(targets the deeper dermal layers of the skin) we are able to treat most skin conditions and concerns at one time- best results are seen with 2 consecutive treatments done about 4 weeks apart. The next few days my skin looked a little pink and had some browns surface, which essentially just debris coming up and shedding off of my skin. My skin felt extremely dry and tight , which is completely normal. I applied a generous amount of moisture and kept it clean. 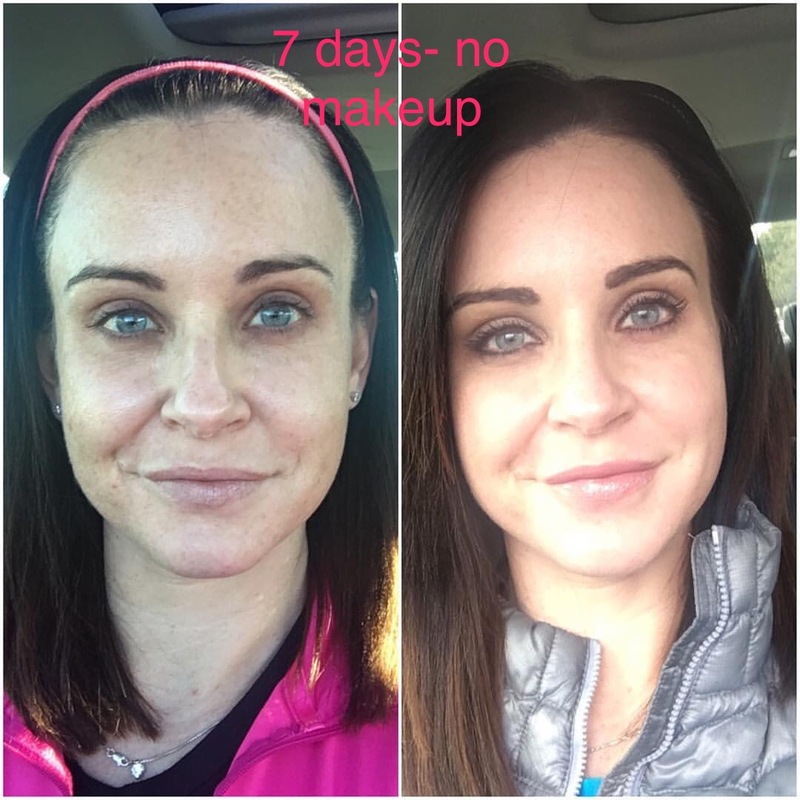 The browns that surfaced got darker and my skin felt a bit like sandpaper, which only lasts for a day or two and slowly started sloughing off by day 3, by day 5 most was gone and by day 7 my skin was glowing and beautiful. Almost 3 weeks later and I haven't worn a drop of face makeup and I'm loving it! After 3 indepth trainings we are rocking out these treatments and seeing some amazing glowing skin! 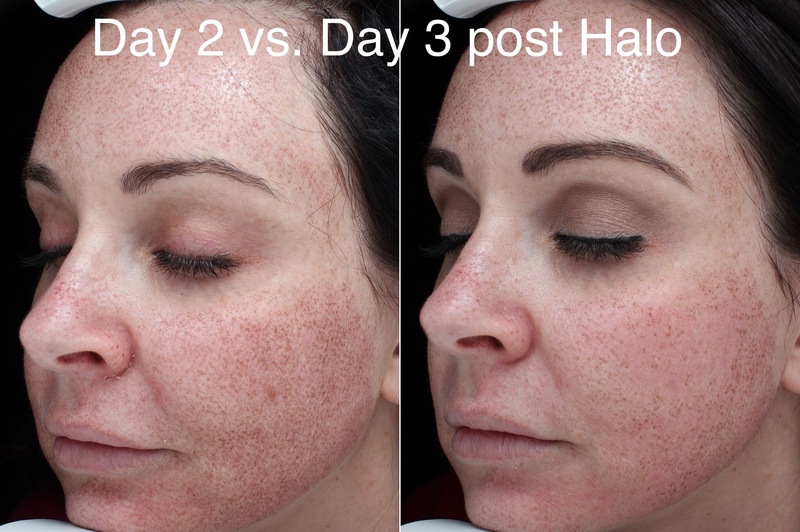 Our schedules are filling quick, so if you're ready for that Halo glow, beautiful skin for summer, contact us soon for your complimentary visia skin analysis so we can get you started! Please let us know if you have any questions and check back frequently for updated before and after photos!